Discounts to regular customers ! 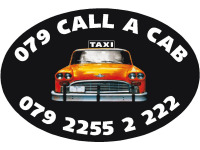 079 Call a Cab is Cambourne's No.1 Taxi Company. We provide a professional taxi service only using executive style vehicles at standard saloon prices. We started up in the Cambourne area as we felt a service like we provide was needed. As Cambourne is some distance from all the main towns, we wanted to save customers the expense of calling for a taxi from Cambridge, St Neots or St Ives. We are based in Cambourne so are in a perfect location for all of the surrounding villages. We have a fleet of saloon cars and also have 8 seater vehicles for larger groups. Our company name also spells out our phone number to help customers remember us. If you look at your phone keypad, dial in our number as if you were writing a text message. You would dial 079 and then write the words Call a Cab. Absolutely amazing service from this taxi company. It was easy to book online and I was called back within 10 minutes to confirm and pre pay my journey. We were running late and they waited for us and made sure that we got to our venue all in good time. They drivers were lovely as were the cars too. Would definitely recommend this company and I would most definitely use them again. Excellent job by the team, stepped in to help out when another local firm let us down. Arrived on time to Longstowe Hall and was very helpful in getting my mum who has limited mobility right to the door of her destination. I use the airport service which is excellent value for money. The drivers are polite and friendly, and always arrive within good time. I thoroughly recommend the company if you need a cab. I visit Cambridge yearly with my family and have consistently gotten excellent service from this company. They have provided corporate work for my husband's business and always gone out of their way to accommodate requests for the rest of the family. You can't beat the pricing, professionalism and reliability! It's nice to finally have a taxi company in the area that has more than one vehicle. I find this company is always efficient & friendly & as far as taxis go, you won't find a taxi company that uses better vehicles than 079 Call a Cab.